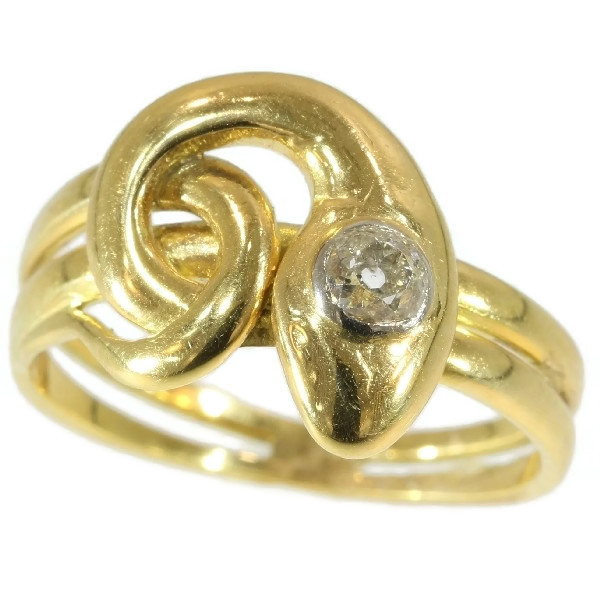 Antique diamond head snake ring 18kt yellow gold: Description by Adin Antique Jewelry. A lovely antique snake ring, diamond set on head, 18kt solid yellow gold shank, crafted circa 1890's, Victorian era, excellent condition... A touch of history. Theme: Snakes and serpents - Serpent is a word of Latin origin (from serpens, serpentis "something that creeps, snake", deriving from the greek word "erpo" and "erpeto", crawl and serpent) that is commonly used in a specifically mythic or religious context, signifying a snake that is to be regarded not as a mundane natural phenomenon nor as an object of scientific zoology, but as the bearer of some potent symbolic value. Diamonds: One old european cut diamond with an estimated weight of approx. 0.25 crt. Total diamond weight: approx. 0.25 crt.